Felix Mendelssohn thought highly enough of his Symphony No. 2 in B-flat that he allowed it to be published; that’s why it’s called No. 2, rather than No. 4, where it stood in order of composition. What he thought was wrong with the Reformation and Italian symphonies—numbers 2 and 3 by composition and 5 and 4, respectively, in their posthumous publication order—is a mystery to the generations of listeners who have loved them. The fate of No. 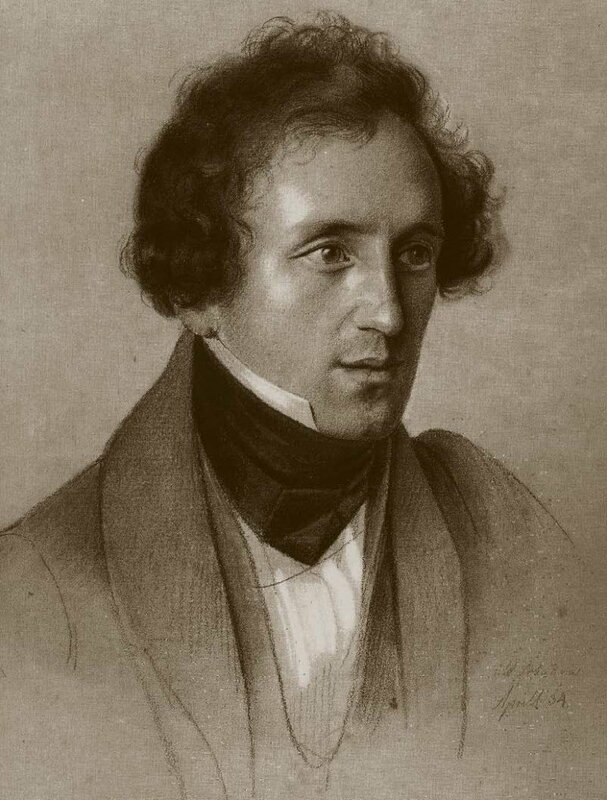 2, which its composer called a “symphony-cantata” and to which he gave the title Lobgesang (song or hymn of praise), was more fraught, but not because of any inherent defects that had escaped Mendelssohn’s notice. This 60-70 minute behemoth (Edo de Waart’s propulsive reading comes in at 61), composed, along with a less demanding cantata, on commission for the 1840 festival in Leipzig celebrating the quadricentennial of Gutenberg’s invention of movable type (and thus of the technology that permitted learning to be disseminated to the masses), got a rare local hearing on April 12 at Jordan Hall courtesy of the Dedham Choral Society under Jonathan Barnhart. Just why this ebullient masterpiece should be so seldom performed in the spring choral season, compared to the usual assortment of dreary requiems, defies understanding. One reason for Lobgesang’s checkered history can be laid squarely at the doorstep of that malign troll Richard Wagner, who sneered at Mendelssohn’s presumed audacity and feeble success in producing a rival to Beethoven’s Ninth, without the latter’s grandeur and weight. Other polemicists then piled on, and Mendelssohn’s work labored under a cloud thereafter. Of course, as programmers will tell you, garbage in equals garbage out: Mendelssohn’s goal was never to produce a Beethoven clone; apart from superficial similarities of structure and the occasional musical hat-tip, Mendelssohn was looking farther back than Beethoven for stylistic cues, notably to Bach (skipping past Handel and Haydn), but with an eye to updating the style and architecture to marry with the Romantic ideas of affect and unity in symphonic writing. The more we hear this piece, the more impressed we are with how well he succeeded. After the purely orchestral movements, Lobgesang enters its cantata phase with an opening chorus based on the motto theme, setting the words “Alles was Odem hat, lobe den Herrn” (all that has breath, praise the Lord). From this point on, Mendelssohn, taking Biblical texts chiefly from the psalms, casts a line whose trajectory leads from light to darkness and back again, limning the argument that God’s word enlightens humanity, with the implicit cultural pun invoking the Enlightenment and the further subtext that Gutenberg, by making the Scriptures available to all, was a key agent of that enlightenment. The music of the nine vocal sections contains some of Mendelssohn’s most effective and beautiful writing; despite its savaging at the hands of Wagner & Co., it was influential, much of it pointing directly to the Brahms Requiem. At the nadir of the schematic, in the fifth vocal section, a tenor aria and recitative begins on the text “the bonds of death held us,” and into this section Mendelssohn indulges in some surprising chromaticism and dissonance, ending with the repeated entreaty, “Watchman, will the night soon end?” To this comes a cathartic soprano response, “the night is gone.” From here forward, the clouds lift, the key wends its way back to the tonic while the music becomes variously exultant and reverent (the seventh number is a marvelous setting of “Nun danket,” with a dramatic a cappella first stanza), building to the finale in which Mendelssohn works subtly by degrees to reintroduce the motto theme, stated in full form only at the very end. It remains to commend the work of the vocal contributors, sopranos Deborah Selig and Renée Saindon and tenor Gregory Zavracky, and the chorus itself. Selig has a superb vocal instrument, dead-center intonation, satisfactory German diction, a well-controlled vibrato and a commanding dramatic presence. In a supporting role, Saindon was evocative and silken, and well matched with Selig in their duet, “Ich harrete des Herrn.” Zavracky was also dramatically effective, clarion and tonally centered, though his vibrato was sometimes a bit wide for our taste; he could have been a bit duskier in the “night” section. The chorus was as well prepared vocally as any community group we’ve heard, and put forth a rich sonority that also held and projected its lines admirably in the two fugal sections, though there were places where the women overbalanced the men—an endemic problem with community, and many professional, choruses. They could also stand some further coaching on unison rising and sitting. The most recent prior performance of Mendelssohn 2 locally was probably the BSO’s under Bramwell Tovey in January 2012, about which our colleague John Ehrlich enthused here. While DCS’s wasn’t up to those standards, we hope its success will encourage other choral societies to reintroduce this great work to standard-rep status.